On Monday, The Hockey Writers will take stock of everything that happened in the Philadelphia Flyers organization in the previous week and how to use it to look forward to the week ahead. 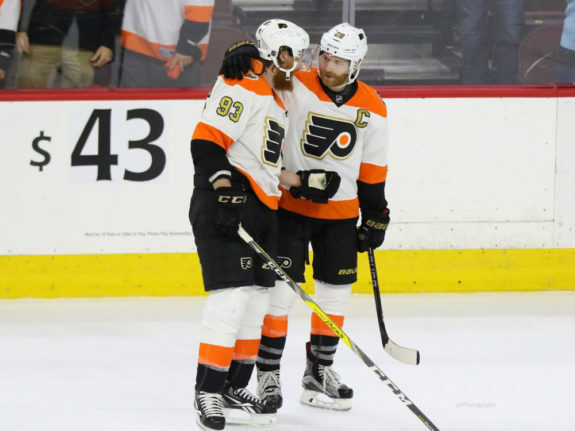 We will analyze the results of the games played and the impact they had on the Flyers’ playoff aspirations, which players were all over the stat sheets, and take a deep dive into social media to find the post of the week. Not only will we look back in time but also take a peek at the important information needed for the week ahead. What challenges do the upcoming opponents pose to the Orange and Black? Which players have a history of success against the looming adversary? The Flyers top prospects will also get featured in both sections as they gear towards making an impact in their postseasons. 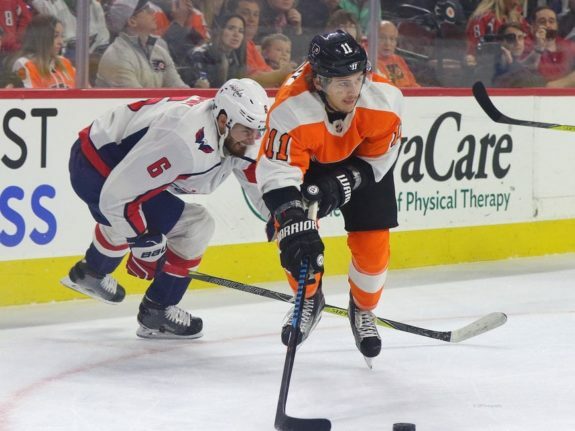 The Good: the Flyers started the week with points in three straight games including sending a message to a possible playoff matchup with a 6-3 victory over the Washington Capitals. The Bad: they failed to make another statement against a possible playoff opponent in a 5-4 overtime loss to the Pittsburgh Penguins. They didn’t gain a victory in the season series (0-2-2) with the Pens for the first time since 2006-07 (0-6-2). Claude Giroux continued to make his Hart Trophy case with eight assists this week. He had back-to-back games with three assists which put him near the league leaders in the category. The captain’s 65 assists tie his career-high and is two points away (91) from tying his career-high. He was also the subject of the social media post of the week. On Mar. 20, vs the Red Wings, he recorded an assist for his 660th point which passed Eric Lindros for fifth place on the Flyers all-time scoring list. Both Alex Lyon and Petr Mrazek did not have a good week with a combined .882 save percentage. Mrazek even got pulled in a statement game against his former team, after giving up three goals on 19 shots to the Detroit Red Wings. Speaking of goalies, the main Flyers prospect news was that goaltender Anthony Stolarz played a game in the AHL this week. After three games in the ECHL, “Stolie The Goalie”, played for the Lehigh Valley Phantoms on Saturday against the Providence Bruins. Besides his power play assist, he did not fare well, giving up six goals on the 35 shots faced as he attempts to return from a knee injury. In more prospect goalie news, Carter Hart and the Everett Silvertips are tied 1-1 in a series with defending WHL champions Seattle Thunderbirds. The 2016 second-round draft pick stopped 53 of the possible 59 shots faced. Tanner Laczynski’s sophomore season continues with the Ohio State Buckeyes as they advance to the Frozen Four with victories over Princeton and the defending champion, Denver. The 2016 sixth-round draft pick had three points (1G-2A) and now has 16 goals and 46 points this season. The Flyers finish up their final road trip with back-to-back games against the Dallas Stars and Colorado Avalanche. They have been strong in the second game of back-to-backs this season going 8-4-1 including 5-2-1 when both games are on the road. Dating back to 2007, Philadelphia is 4-4 in games played at the American Airlines Center. Jakub Voracek has 19 points (3G-16A) in 22 career games played vs the Stars. The Flyers have points in three-straight games in Colorado (2-0-1), including winning the last two. This was after they went winless at the Pepsi Center from 2003 to 2014 (0-4-3). Valtteri Filppula has the most points (23) of any Flyers players against the Avalanche, but most of those came when he was with the Red Wings. The Flyers finish the week with an April Fool’s Day matinee at home against the Boston Bruins. Philadelphia is 0-2 against Boston, being outscored by only a 6-2 margin. Claude Giroux has 24 points (7G-17A) in 32 career games played against the Bruins, but only has one assist in the 2 games played this season. Moving to the Flyers prospects’ upcoming week, the AHL Phantoms have two home games next week, Friday against the P-Bruins and Saturday against the Belleville Senators as they inch closer to their first division title since 2004. Keep an eye on Mikhail Vorobyev, who has 10 points (3G-7A) in his 11 games played this month. In the OHL Playoffs, Morgan Frost and the Sault Ste. Marie Greyhounds could finish their series with Saginaw Spirit as they play Game 3 on Monday and Game 4 on Wednesday. Game 5 would be Friday and Game 6 would be Saturday, if necessary, as the Greyhounds are up 2-0. Frost, the Flyers 27th overall pick in last summer’s draft, had four points (2G-2A) in the first two games.